Amadeus Pro is a powerful multitrack audio editor supporting a variety of formats including MP3, AAC, Ogg Vorbis, Apple Lossless, AIFF, Wave and many others. ? ?Each track can have its volume adjusted independently from the others. Amadeus Pro fully supports multitrack WAVE files and allows you to render sound on up to 5 different loudspeakers simultaneously. There's that whole collection of files that you wanted to convert to Mp3, but you first wanted to normalize them and make them fade in and out nicely.
? ?Several hours of work in perspective? Let Amadeus Pro do the work for you! The powerful batch processor allows you not only to convert large numbers of files between any of the supported formats, but you can also instruct Amadeus Pro to apply any sequence of sound effects.??
? Amadeus Pro is a fully featured multitrack editor.
? Each track can have its volume and panning adjusted independently from the others.
? Each track can be split into multiple audio clips that can easily be dragged independently of each other.
? 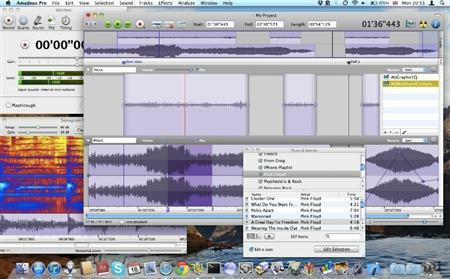 Furthermore, Audio Units can be applied to individual tracks in real-time without requiring any destructive editing.
? There’s that whole collection of files that you wanted to convert to Mp3, but you first wanted to normalize them and make them fade in and out nicely.
? Several hours of work in perspective? Let Amadeus Pro do the work for you!
? The handy repair centre allows you to find and to repair cracks with a simple click of the mouse.
? Furthermore, Amadeus Pro’s powerful denoising functions allow you to easily get rid of that annoying hiss on your old tape recordings or of that 50Hz hum picked up by a badly insulated microphone.
? Amadeus Pro’s powerful denoising and repairing functions make it easy to remove that annoying hiss on your favourite tape recordings or the scratch on that old vinyl recording.
? 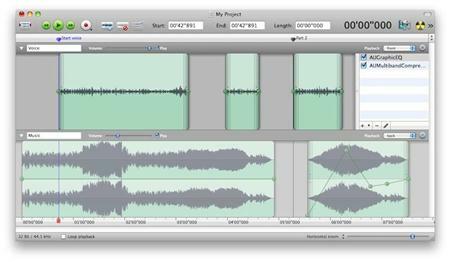 Split your recording into multiple tracks with one handy function, for use by iTunes for example.
? Burn your recording to an Audio CD straight away from within Amadeus Pro with a simple click of the mouse.
? Dedicated equalizers make it easy to get the original sound back from very old recordings.
? Converts to and from the following file formats: Amadeus, AIFF, WAVE, Mp3, Ogg Vorbis, Mp4, M4a (AAC and Apple Lossless), FLAC, Apple CAF, QuickTime, SoundDesigner II, Next, Mp2 (reading only).
? Allows you to apply arbitrary sequences of sound effects to a collection of files.
? Preserves metadata (artist, song title, album cover, etc) even across formats, provided that the format supports metadata.
? Full support for both Audio Unit and VST audio Plug-Ins means that the functionality of Amadeus Pro can be extended and tailored to suit your particular requirements perfectly.
? The most commonly used effects (multiband graphic equalizers, volume normalization, fade in/out, echo, speed and pitch change, etc) are built into the program and therefore benefit from a nice MacOS X – like user interface.
? Amadeus Pro allows you to maintain a list of favorite actions, so that your commonly used tasks are always only one mouse click away.
? Create high quality sonograms or spectrum analyses for professional or amateur use.
? The many real-time analysis tools of Amadeus Pro make it the perfect pedagogical tool for explaining the physics of sounds. •	Fixes a bug causing crashes for some users.
? Intel, Mac OS X 10.6.8 or later. Amadeus Pro v2.1.5 MacOSX Fast Download via Rapidshare Hotfile Fileserve Filesonic Megaupload, Amadeus Pro v2.1.5 MacOSX Torrents and Emule Download or anything related.